[The Wizards took down the Summer League’s Denver Nuggets, 97-69, in their third game in Vegas. TAI’s Conor Dirks, Kyle Weidie and John Converse Townsend share their rapid reactions. 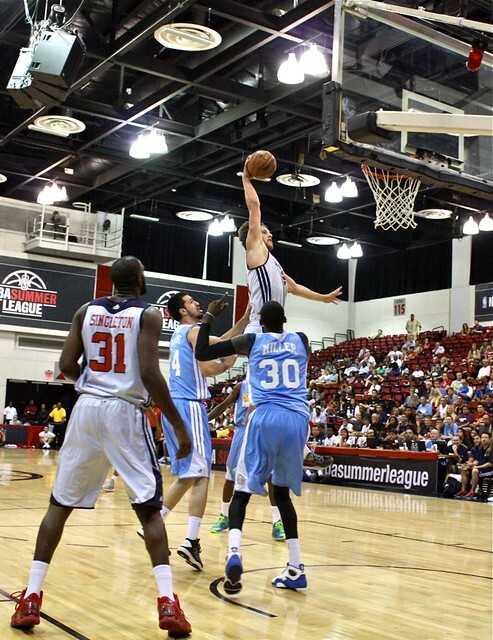 In a battle between winless Summer League teams, the Wizards came out on top. In fact, they mopped the floor with the boys in blue. The Wiz secured a 10-point lead over the Nuggets in the first quarter, 24-14, led by Marquez Haynes (7) and Jan Vesely (6 … jumpers!). While they tacked on just a single point to that lead by halftime, the Wiz hit the ground running in the third quarter, increasing the difference to 20 points by way of an 11-2 run (Glen Rice, Jr. had 5). People often say you finish games the way you start, and that was true on this night. In the fourth, even with the starting 5 punched out and resting on the bench, the Wizards outscored the Nuggets 27-13. Denver led for all of 51 seconds in the game—the first 51. Washington finished with twice as many assists (22) and nearly half the turnovers (6). At the 7:40 mark in the first quarter, Jan Vesely sprinted ahead after a Chris Singleton defensive rebound. Singleton found Vesely on the leak, and Jan beat everyone else to the basket without having to take more than two steps with the ball. After the bucket, Vesely closed out a nice defensive possession by getting his hands up and taking an awkward, hand-wheeling charge in the paint. With his alpha status established and the tone definitively set, the Flying Czech went on to bring some “No Resale” Summer League joy into the calloused hearts of Washington fans. You have to love the heroic restraint from Randy Wittman, who maintained a cool, nonplussed demeanor during an in-game interview being conducted at the zenith of Vesely’s takeover (a stretch throwdown in the pick-and-roll with 2:45 remaining in the second quarter). Um… Jan Vesely, please! Yea, it’s just Summer League, and the Nuggets, ranked worst amongst the 22 teams in Vegas heading into tournament play, leave a lot to be desired. But, dude, JAN VESELY! He showed post moves—baby hooks and Antawn Jamison-esque right-handed flip-ins going to his right shoulder. He displayed basketball smarts—nicely helping defend the ball-handler off pick-and-roll action and making the Nuggets respect his passing ability out the post. He dunked the crap out of the ball—you see the pictures. And perhaps the most giddiness-inducing aspect, Vesely hit jumpers with confidence not even seen during last year’s Vegas Summer League—Wizards brass in the stands couldn’t help but crack sly smiles. Vesely’s 18 points on 9-for-11 shooting in just under 22 minutes of action was the most he’s scored in an NBA-affiliated game, ever (Summer League, or regular season, or preseason). Again, it’s just Summer League, but the hope is that this is the stepping stone to Vesely finally shedding the “bust” label. Otto Porter’s right hamstring. Not very many narratives will benefit from this injury, especially if Porter’s right hamstring tightness keeps him out of more than just the last three quarters of this contest. The “It’s Just Summer League” folks weren’t watching anyway, or were just having fun with available positive takeaways. The “He Hasn’t Shown He Can Compete with Summer League Competition” folks were hoping for more conclusive proof for their assertions. The “He Can Still Turn It Around” folks are probably the most victimized party here, teased by Porter’s strong start (2-4 shooting with a few nice plays at the rim) before he committed a bad hot potato ball-bobble turnover and left the game with right hamstring tightness. Runner-up: Evan Fournier was the Nuggets top scorer (12 points), but he also turned the ball over seven times, committed five fouls, and was dead last in plus/minus differential, at minus-26. Victories are had by creating—and making—easy buckets, and Summer League teams will always be more effective at running the break than they are in the half court. The five steals and nine turnovers the Wizards forced in the first quarter helped them make it a track meet and they crossed the finish line ahead by a mile, winning the transition battle by double-digits, 16-6 (7-7 FG). Chris Singleton was a pretty big factor, despite a so-so performance overall. Although he had just four points, he pulled down 10 rebounds and would immediately put the ball on the floor looking to keep the Nuggets on their heels. Singleton finished with five assists. And Otto Porter seemed to finally have some pep in his step (before his hamstring gave out on him towards the end of the 1st). He was in the right place at the right time for a Rice, Jr. dump-off at the rim (created by a Vesely steal and scramble). Porter, a real breadstick, also slammed home a fast-break dunk with a surprising amount of power, which I believe counted as his first highlight of the Vegas Summer League. Worth noting: points in the paint. The Wiz outscored the Nuggets in the paint by 12, putting up 46 points on 38 attempts compared to Denver’s 34 points on 31 attempts.